I have a few things in progress right now that I’d like to share. 1. The first is a nascent collaboration with my undergraduate SB department, Course 3 (Department of Materials Science and Engineering) at MIT. If you look around at Science Imagery aimed at non-scientists and at Science art, there’s some space-focused work, a bit of quantum, a bit of math, a good amount of biology and critters, but not very much Chemistry and almost zero Materials Science. This is a pity, really. Materials Science is a deeply, inherently visual science. Much of our data comes to us as pictures. Many of those pictures are stunning images by themselves. The insight generated by those Materials Science pictures drive most of the technology and life-easing scientific advances that normal people encounter and use daily. My own scientific discipline should be a rich and fertile ground for artistic inspiration – more than any other science. So where’s the art? I think that part of the answer to that question lies in public perceptions of Materials Science. Few people know what Materials Science is or what it does. Many have never heard of the field, or assume that it “has something to do with fashion”. Simply stated, Materials Science is the study of condensed matter. Materials Scientists study solids and to some extent liquids. This includes metals, ceramics, electronic materials, polymers, biological materials, gels, films, pastes, fibers, composites etc. Unlike Mechanical and Chemical Engineers, whose concern is primarily using and moving all that wondrous materials “stuff”, Materials Scientists focus on understanding just what micro and nano features make the solid stuff wondrous. The study of materials touches chemistry, engineering, biosciences, and pure and applied physics, acting as a missing link to tie all the disciplines together. There’s an added dimension to the Materials Science Art connection. Materials Science is one of the key disciplines involved in understanding artists materials. What would you like to see from the next generation of artists materials? How would you like to use them? What should they look like? work like? do? By building a bridge between artists and Materials Scientists we can get more of these inspiring technical images and underlying ideas into the hands of artists, and out into the world, seen, perceived, understood. There’s also a potential for getting novel materials and properties into the hands of artists, to be used in creative new ways. 2. And some paintings in progress as i get ready for some upcoming exhibits. Two science-driven paintings were described in a prior post in a fairly early and unkempt state. Another in progress painting is almost finished, I’d say about 60%. This one is called “Tree of Life”, and it fits into my series of tree-like structures as metaphors for ecological order and resilience (links to more info on the series at the end of this post). Here it is in it’s current state. Still some work left to do to bring it all together. 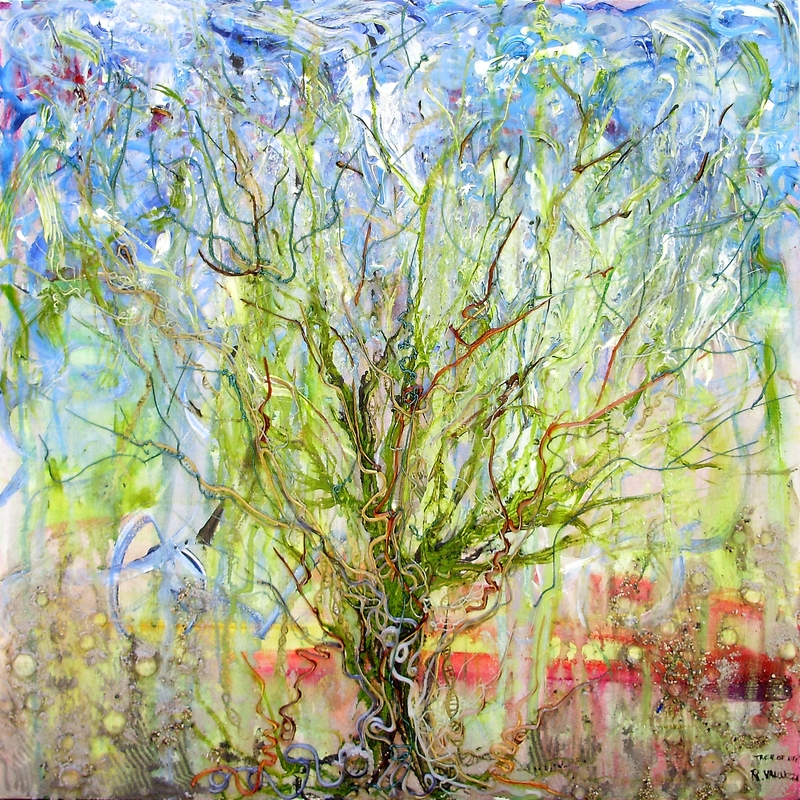 In progress “Tree of Life” Acrylic with glass and pumice gel on canvas, 36 x 36 inches. If there are any artists out there interested in: seeing how the Materials Science collaboration develops; being part of the collaboration; being part of a data-themed exhibit, please drop a note or something so I can find you. We’re exploring a bunch of ideas right now, and I can’t guarantee anything, but interest on both sides is critical to getting something good to happen.